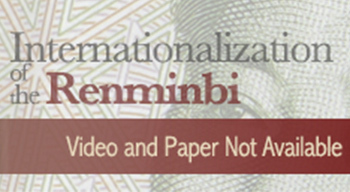 This two-day conference brought together leading policy experts and economists from China, Hong Kong, Asia, and the U.S. to analyze the logic, dynamics, and the domestic and international ramifications of the internationalization of the Renminbi, or RMB. Conference participants had a rare opportunity to hear top officials, bankers, and scholars on one of the most important issues facing global economy today, and to participate in networking opportunities with keynote speakers, panelists, and other attendees. "The Use of RMB in International Transactions: Background, Development and Prospect"
"Implications of Renminbi Internationalization for the U.S. and the Global Economy"
Chairman of the Board and CEO of Sohu.com, presenting sponsor of the Internationalization of the Renminbi conference. "Domestic Financial Reform and RMB Internationalization"
"The RMB Internationalization and Price Deregulation in Factor Market"
"The RMB and Chinese Rebalancing"
"Unleashing the Dragon: Possible Effects of Capital Flow Liberalization in China"
"RMB Offshore Market and China’s Capital Account Liberalization"
"RMB Internationalization or Onshore-Offshore Arbitraging"
"International Use of the Renminbi: Hong Kong’s Experience"
"The Role of RMB in Stabilizing the Chinese and Global Economy"
"What Does Shanghai Need to do to Become an International Financial Center?" "U.S. Views on RMB Internationalization"
"Regional Economic Integration and Cooperation and RMB Internationalization"
"The Geopolitical Impact of Internationalization of a Large Currency"
"RMB - A Leftist Approach"
"The RMB Internationalization and its Impact on Asia"
"Euro–dollar Banking and Currency Internationalization"